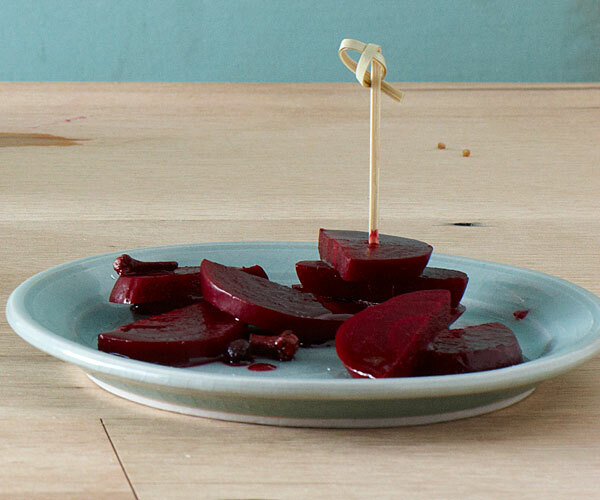 A twist on traditional pickled beets. Using red wine, red wine vinegar and orange juice gives them a tang and a nice change. 1. Put the beets in a large pot and add water to cover. 2. Bring to a boil. Simmer for 25 minutes until just tender. 3. Strain and let sit until cool. 4. Peel and halve the beets. Slice in whole or half rings or how you prefer. 5. Add wine, vinegar, orange juice, sugar, cloves and salt to a small saucepan. 6. Bring to a boil and simmer over medium heat until the sugar has dissolved. 2-4 minutes. 7. Pour the liquid over the beets and let sit at room temperature until cool, about 2 hours. 8. Cover and refrigerate for up to 6 weeks.